This performance of “The March of the Women” appears courtesy of VocalEssence, which was founded in 1969 as the Plymouth Music Series. Performers include: Eiddwen Harrhy, soprano; Janis Hardy, alto; Dan Dressen, tenor; James Bohn, bass; Chorus of the Plymouth Music Series with orchestra; Philip Brunelle, conductor. 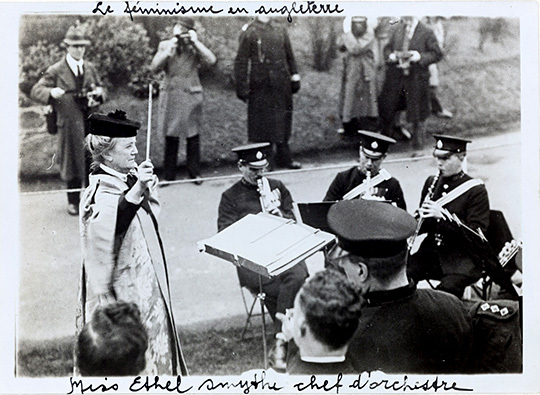 I became interested in the music of Ethel Smyth while in London in the early 1970s, visiting with a staff member at Novello’s. I had read about her previously and wanted to see the score of her Mass. This fellow, Giles Easterbrook, was thrilled to find someone interested in her music and proceeded to show me all that they had. Knowing that the Mass would not fill the entire CD I wanted to include the March knowing of its interest historically. I shared that information with the women of the chorus and with the orchestra and I believe that, knowing this, they gave the performance an extra ‘oomph’! However, I did not conduct it with a tooth brush as Dame Ethel had! 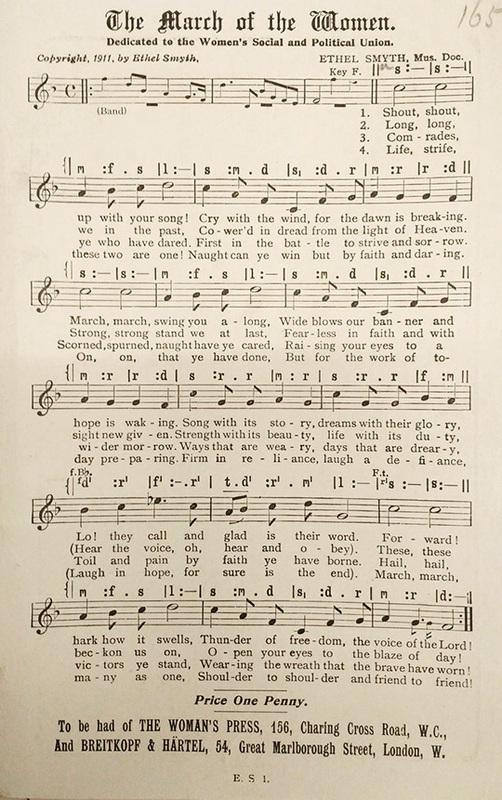 Composed by Ethel Smyth in 1910, “The March of the Women,” was first performed in London on January 21, 1911 to celebrate the release of imprisoned suffragists. It was named the offical anthem of the Women’s Social and Political Union (WSPU) in the UK by Emmaline Pankhurst and was later popularized among American suffragists. It was necessary to appeal again to the nation. We called for demonstrations of public approval of the amendment in every state on May 2. Thousands of resolutions were passed calling for action in Congress. These resolutions were made the center of another great demonstration in Washington, May 9, when thousands of women in procession carried them to the Capitol where beautiful and impressive ceremonies were held on the Capitol steps. The resolutions were formally received by members of Congress and the demonstration ended dramatically with a great chorus of women massed on the steps singing “The March of the Women” to the thousands of spectators packed closely together on the Capitol grounds. 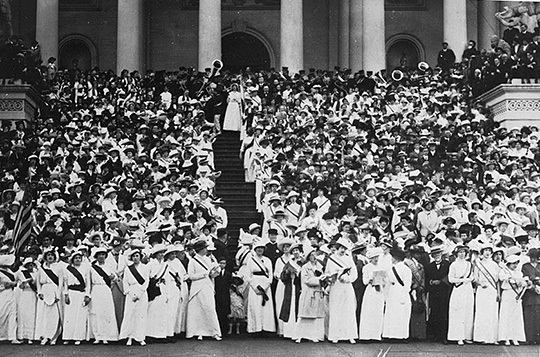 Congressional Union for Woman Suffrage procession of May 9, 1914, on the steps of the U.S.
Dame Ethel Smyth. at the unveiling of the Emmaline Pankhurst memorial statue in London’s Victoria Tower Gardens, March 6, 1930, conducting a police orchestra.